Wedding Weekend in Blacksburg - Take a Hike! For the last weekend in September, Sandy and I headed up to Blacksburg, Virginia for Casey and LeAnna’s wedding. We left very early Saturday morning so we could get a couple waterfalls on the way up. We got off I-77 near Bland and headed into the Eastern Divide Ranger District of Jefferson National Forest, stopping along Forest Road 201, Dismal Creek Road. From here, it was less than a tenth of a mile down Dismal Falls Trail (#1058) to Falls of Dismal. Although it’s nothing like the spectacular the Dismal Falls of North Carolina, Virginia’s Dismal Falls was very scenic. The water level was a little low, but the leaves were starting to change, making for a very pretty scene. There were also some cool rock formations along the creek near the falls. We climbed around on the rocks, getting pictures of the waterfall from different angles. The creek-wide waterfall tumbles down about 10 feet over a number of ledges at a bend in the creek. After a few pictures, we headed back to the car and drove east towards Blacksburg. From US-460, we headed east on Route 603 to the North Fork of Roanoke River. We crossed the river on a very sketchy one-lane bridge and followed a gravel road into Falls Ridge Preserve. The Nature Conservancy has protected this beautiful area and allows public access. After getting our stuff together, we set off hiking across the open area and into the preserve. Just past the open area, we turned right at the fork to follow the Bradley Trail to the waterfall. A wooden overlook provides nice views of the scenic travertine waterfall. 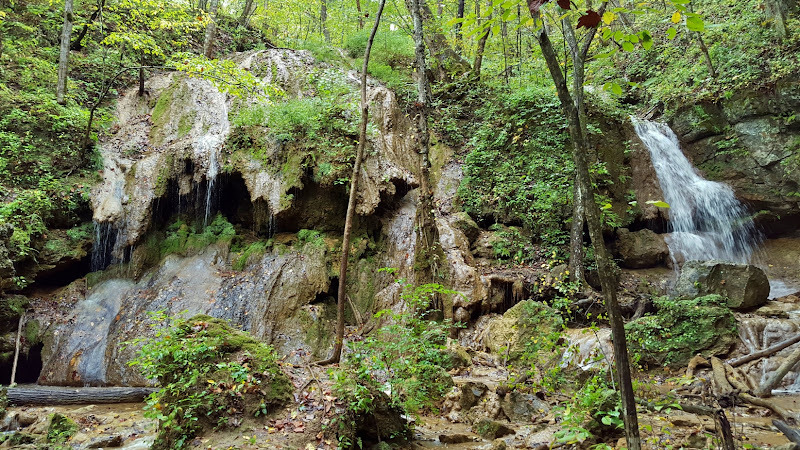 Next to the waterfall are a bunch of small travertine caves with thin streams of water flowing down over them. We got a couple of pictures and then headed up past the waterfall. There were a bunch of small cascades where the water flows over deposits from the creek. We continued on and turned right at the next fork to follow the red-blazed Chamberlain Trail up to the top of the ridge. The trail is moderately steep, but nothing too strenuous. At the top, the trail makes a short loop around the summit, but the dense vegetation at the top prevented any good views. It was overcast anyway, so we wouldn’t have been able to see anything. We did see a cute box turtle along the trail, though he stayed in his shell while we tried to get a photo. We then followed the red trail back to the beginning and turned right to head back to the parking lot. Along the way, we stopped at some of the fantastic caves near the waterfall. The caves aren’t very big, just a few were large enough that we could squeeze in for a picture. One was particularly interesting – it really resembled a face with two small caves high up as the eyes, a protrusion that looked like a nose, and a wide cave at the bottom that resembled a mouth. As we hiked back through the open area, we saw a little red eft, the terrestrial juvenile stage of the eastern newt. We finished up our hike and then headed back towards Christiansburg. We ate a light lunch at Ruby Tuesday and then checked into our room at Fairfield Inn. After a quick shower, we changed clothes and headed to the Blacksburg Country Club for the wedding. It was an outside wedding, but the weather was a little dreary. They erected a tent for the ceremony and then the reception was inside. We had a really nice time celebrating with Casey and LeAnna on their special day and it was a beautiful wedding. Sunday morning, we had breakfast at the hotel with Chris, Mel, Heather, and Danny and then checked out. There was a plan to go to Cascades Falls on Sunday, but Casey and LeAnna were busy with family stuff, so Sandy and I headed there by ourselves. We headed west on US-460 to Pembroke and turned on Route 623 into Cascades Day Use Area. After paying the day-use fee, we began our hike. Normally, I would hike the lower trail to the falls and the upper trail back to make a loop. But we weren’t sure if Casey and any others would be arriving later, so we hiked in the opposite direction to maybe run into them. We hiked the upper trail which follows an old roadbed upstream along Little Stony Creek high above. It’s up on a ridge above the creek, so we couldn’t see the creek while hiking, but there were some nice rock formations along the trail. We also saw a cute little chipmunk on some big rocks along the trail here. When we got to the split to go down to Cascades, we continued on the trail another half-mile to Upper Cascades. There’s a split in the trail and we went right to head to the Upper Cascades. This was my first time to the area when the waterfalls weren’t frozen, so it was interesting to see them in their normal state. Due to the rain over the past day, the Upper Cascades was flowing quite well. We climbed down the wet rocks to get to the base for a picture of the waterfall. The water level was high enough that it was hard to get far enough away to get a picture of the entire thing. What a difference a rainy night had made! After some pictures at the base, we climbed back up to the top for a view of the waterfall tumbling down the ledges. Then, we started hiking back. Back at the split, we turned left to head down to Cascades. This 70-foot waterfall is truly spectacular – one of the best in Virginia, in my opinion. And this was my first time seeing it when it was not frozen. It started to rain while we were here, but Sandy had an umbrella so I could get a couple pictures of the waterfall without getting the camera wet. Then we started hiking back along the lower trail, following Little Stony Creek downstream back to the parking area. The creek is rocky and has many small cascades and drops downstream from Cascades and the rain had stopped shortly after we left the waterfall. We saw a small waterfall on a small tributary of the creek. I imagine that this waterfall only exists after a good rain. We stopped at a couple more points along the creek on our hike back to view the pretty cascades. Near the trailhead, we saw the old sawmill boiler that was used for power when the area was being logged. Soon, we made it back to the parking area and started making our way home.